Sorry, it has been a while since my last posting. I have been thinking of re-arranging the site to also include ArcGIS guides/tutorials as well as other software applications that I'm learning and experimenting with. For example, I'm currently learning about Docker and how to use it as a way to easily build web apps in a container environment. Also I've been learning Sphinx for documentation writing. I'll write something up once I'm done with experimenting. So with that said, this post is a summary of an ArcGIS training workshop that I did earlier in September of this year that I'd like to share. Special thanks go out to Paulo Maurin, Gretchen Chiques, Annette DeRoches, and Risa Orem at the NOAA Inouye Regional Center, Ford Island for organizing the GIS4DAR workshop and inviting me to do the training. The purpose of this training workshop was to teach the Hawaii Department of Land and Natural Resources, Division of Aquatic Resources (DAR) staff how to apply GIS to their research. Below is a synopsis taken from the GIS manual and a preview of the Table of Contents so you can see what the training was all about. 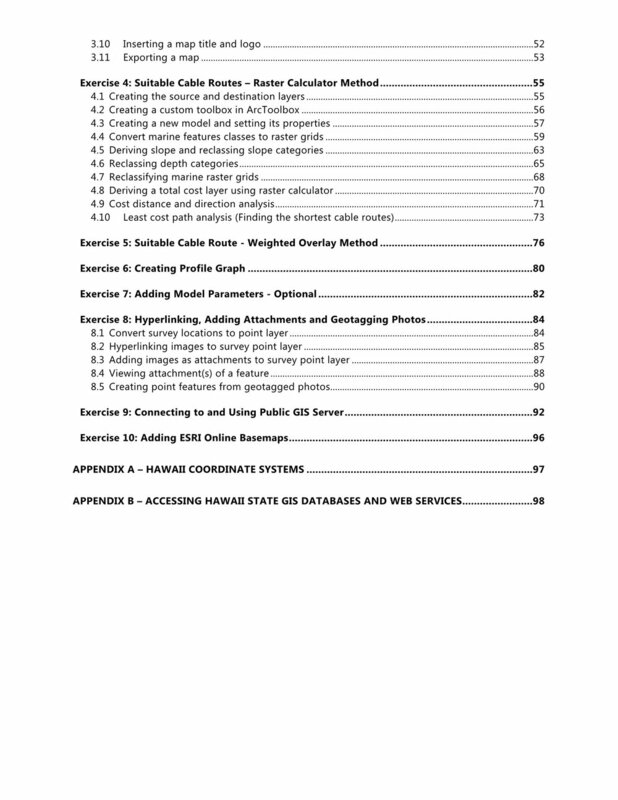 You can also download the GIS4DAR Training Manual - Please be patient. The pdf file is about 100 pages and is ~6 MB. The data for the training is really large (~1 GB) so I'm still trying to figure what is the best way to post it for downloading. But in the meantime if you would like it - please email me directly. Use the ArcCatalog application to store, organize and manage spatial data such as creating geodatabase and metadata. Use the ArcMap application to view spatial data and make maps/visuals; and learn the basics of cartographic design. Use the ArcToolbox application to process/analyze spatial data, such as deriving slope from a bathymetry model (or DEM) and doing data conversion. Use the Model Builder application to create models and create a project work-flow process. Use the Spatial Analyst Toolbar to do raster analyses, such as calculating the shortest or least cost path from one location to another. The training is broken up into 2 sections, an ArcCatalog section with 3 exercises and an ArcMap section with 10 exercises. The ArcGIS Desktop 10.4.1 with a Standard or Advanced license plus separate Spatial Analyst and an optional 3D Analyst Extensions are required. The case example being used in this tutorial is based on a project done in 2009 conducted by UH Manoa, School of Ocean and Earth Science and Technology (SOEST). More information for the survey project can be at: http://www.hawaiicleanenergyinitiative.org/storage/interisland_cable.pdf (last accessed 8/24/2017). Note that the methods used in this tutorial are only for the purpose of teaching GIS/ArcGIS, and are not necessarily reflective of the actual methods used in the real project. Case scenario: As part of a renewable energy initiative, the Hawaiian Electric Company (HECO), with assistance from the State of Hawaii (DBEDT) is planning to integrate wind energy into the Oahu electrical system. The wind energy is expected to come from one or more wind farms on Lanai and/or Molokai and transmitted to Oahu via an interisland, undersea cable system. The proposed plan is to have either 1) two, 200 MW wind farms: one on Lanai and another on Molokai to integrate with Oahu’s electric grid, or 2) a single 400 MW facility either on Lanai or Molokai to integrate with Oahu’s electrical grid system. A later phased cable extension to Maui is also being looked at. Your Task: To determine if it’s feasible to have such an undersea power transmission system and if so suggest possible cable transmission routes.